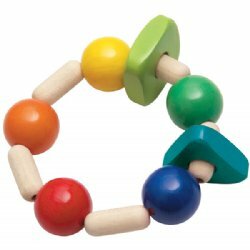 BabyNaturopathics.com - Selecta Rombino Wooden Clutching Toy - Baby Naturopathics Inc.
You can earn 8 bnReward Points on this product! Rombino has five colored wooden spheres and �five�natural wooden�cylinders. There's�also a square and a triangle (both with smoothed edges) that�clack when you shake the toy. The beads are threaded on an elastic cord so you can squish Rombino. Rombino's colors will remain bright for years to come as Selecta Spielzeug uses a special printing process that helps protects its toys from scratches and moisture damage. All colors are non-toxic and safe of course! An additional finish of beeswax is added to Selecta infant toys. Made in Germany.